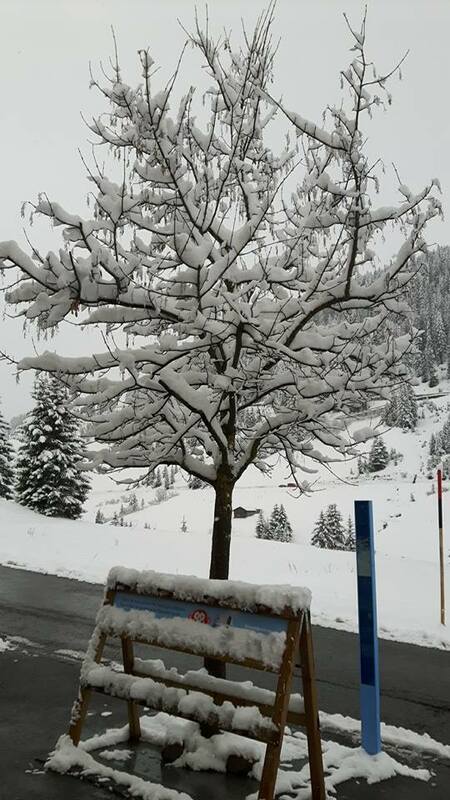 There’s been up to 30cm (a foot) of fresh snow on the Eastern side of the Alps over the Easter weekend. Mid-winter conditions have returned – probably briefly – to resorts like the Arlberg region’s Lech (pictured above and below this afternoon) and St Anton where the ski season still has a fortnight left to run. Although more than half of the northern hemisphere’s ski areas had closed for the season by yesterday evening (Easter Sunday), some did see fresh snow on closing day after a largely warm and Sunny spring to date. The snow has also fallen at glacier resorts open later in to May like Switzerland’s Engelberg and Austria’s Molltal Glacier. Other areas to benefit included the Zugspitz glacier in Germany but the snow has also fallen to low levels in some places such as the Zillertal Arena in Austria which reported 21cm of new snow. The fresh snow in the Alps follows more heavy snow in Western North America and record low temperatures in parts of Sweden for Easter.